When it comes to table games, blackjack is the most popular casino game, and this is true for online casino play, too. 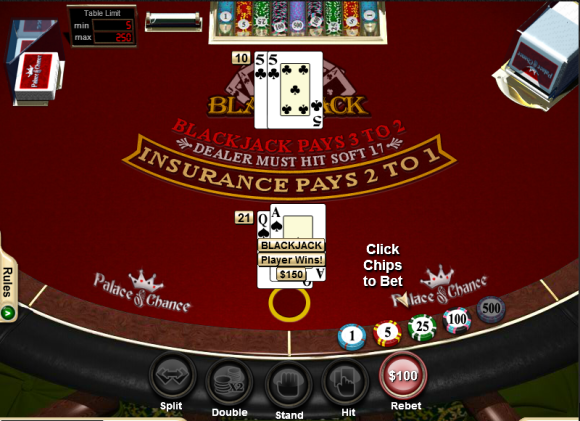 Blackjack is an extremely juicy casino game, and it also happens to be pretty simple to get the hang of. Basically, you want to get as close to 21 with the count of your cards without going over. If you beat the dealer’s number, you win! Thanks to being so simple, this game enjoys a lot of attention, both at the brick and mortar casinos, and when it comes to online casinos. There are a few variations of this game that you will find out there, and a top online casino should have several of these variations available for you to play. Blackjack is fun because there is a strategy involved. This has even been popularized in a Hollywood movie and several books. And what’s more is that strategy is even important when you are playing online. Playing as perfectly as possible, even when playing on a random automated machine, can allow you to maximize your profits in a big way. The more strategy that you know and employ, the better off you will be in the long run. Playing online can be exciting, but a lot of it depends upon the software that you use, and this is true whether you are playing for fun, real money, or even if you want to play on a mobile casino. This game is extremely popular, and as such, casinos have spent a lot of time ensuring that they have the very best games in this area in order to attract customers. First, look at the game you are interested in. Classic blackjack is pretty fun in itself and very easy to find, but if you want to play Spanish 21, Chinese Blackjack, Double Exposure Blackjack, or Blackjack Switch, you might need to look a bit harder. Once you find a casino that has the game or games that you’re interested in, decide how you want to play them. Some of the harder to find games may not allow you to play for free, so it’s important that you pay attention to all of these factors before you start playing. Also, not all of these games may be available if you want to play on your phone or tablet. Mobile gaming is definitely becoming more and more popular, so this is something to consider. Some of what you will be able to do in regards to playing blackjack will be determined by your geographical location. Not all blackjack software providers allow U.S. players, for example. Of the five major platforms, only Rival Gaming and Real Time Gaming will allow players from this part of the world to partake. Still, these represent some serious casinos, such as Bovada (www.bovada.lv), and Casino Titan (www.casinotitan.im). As you can see, you do not need to sacrifice your gaming experience just because you live in the USA. Overall, the best casino for you to play at will come down to a few different things. One, you need to look at how easy to use the platform that you’ll be using is, and whether or not it will be enjoyable for you to play at. Next, look at the casinos bonus structure. If you’re not getting a lot of mileage for your money, the odds are slightly less in your favor. So you always want to make sure that you are maximizing your bonus cash. More money undoubtedly means a lot more fun for you in the long run. Third, look at the games offered by your casino. And then finally, figure out where you will be playing. Playing at home is simple, but when you want to play at a mobile casino, there’s a need for some investigation on your behalf. We have taken care of a lot of this trouble for you already. Blackjack is one of the few casino games where your talent levels can have a definite impact upon how much money you make. This makes it a great game for you to play if you want to go well beyond just the standard luck based casino games that are out there. Regardless of what style of blackjack you wish to play, or how you wish to play it, you are guaranteed to have a lot of fun. A juicy casino will ensure that you make sure that you get exactly the experience that you are looking for in your online gaming.